The crew of Miss Rockaway spent two amazing summers on the Mississippi River experiencing the unbelievable hospitality, kindness and fun of the folks we met all along the river. Right now our we’re thinking of our friends in Clarksville, Canton, La Grange, Hannibal, Louisiana, Alton, Quincy, Burlington, Muscatine, Oquawka, Keokuk, and all areas affected by the recent flood. It comes as no surprise that the resilient folks in these towns are pulling together and holding back the water with sandbags. We’re thinking of you and thank you a million times over for all you’ve done. Remains: the center raft/galley of the main Miss Rockaway vessel with the modified front raft docked to it. The initial incarnation of the Miss Rockaway Armada ended it’s voyage in St. Louis, Autumn 2007. Scroll down for photos! While we don’t currently have plans to continue along the Mississippi river, offshoots and branches of the Miss Rockaway Armada are working on projects on water and land. We’ll keep the website updated when there’s news to report. Please visit our events page for details on a current group art show in New York at Exit Art that Miss Rockaway is participating in. Also rapidly approaching is an installation the crew is building in Massachusetts at MassMoCA. Click here for more info. Once landed in St. Louis in a very difficult tow upstream (click here for the full story) the crew decided it was time to return the fleet, or at least large parts of it, to the scrap it came from. 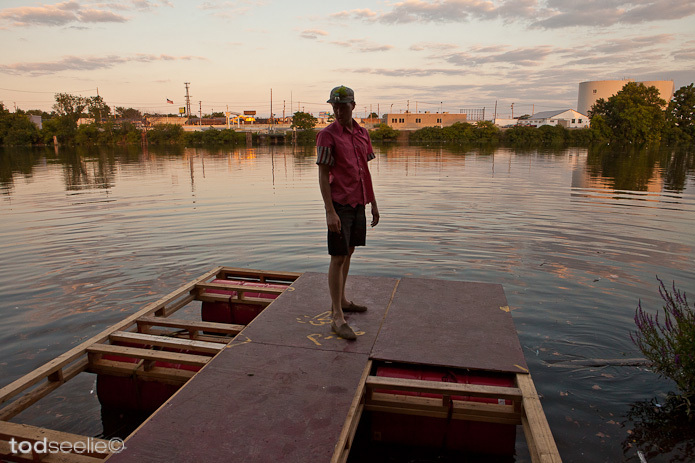 We worked day and night at the waterfront to take the rafts apart, occasionally inviting friends to come see the rafts. The Miss Rockaway in St. Louis with the front raft structure dissembled. Crew members and friends helping to take down the helm. The cement bridge at Cementland, our landing spot in St. Louis, with crew member Nick. Some kind friends of Miss Rockaway came along and welded some safety railings to the cement bridge. Soon after there was a show, but this time other people played for us, and we just danced. Staying on in St. Louis through the colder months of fall and winter, the Rockaway Crew cleaned up the docking sites. Bold members of “Team Bling” as they worked into the cold fall months repairing the now destroyed “Garden of Bling” raft. “I Left My Heart in Kirksville” paddlewheel raft during it’s dissembly. You are currently browsing the The Miss Rockaway Armada weblog archives for the blog category.